A joyful noise. Or not. 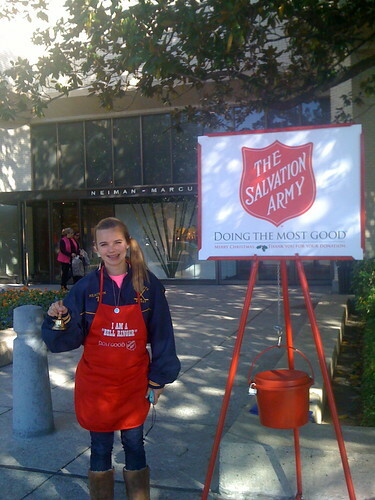 Dots and I manned a Salvation Army kettle outside a nearby mall last Saturday as part of our National Charity League chapter's Philanthropy Day. Vivian sat us with but complained often, "That bell hurts my ears!" Vivian's class took a walking field trip to a neighborhood Italian restaurant today. 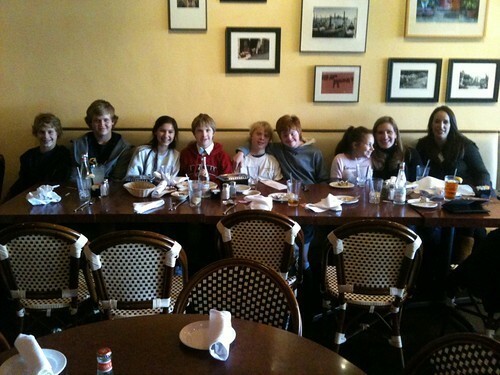 They had been practicing ordering and using their best table manners at school before the big outing. I received these pictures and texts from Vivian's wonderful teacher this afternoon. It sounds like a successful experience! We had a wonderful time today. 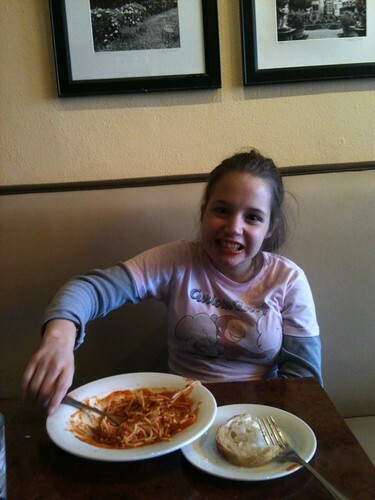 Vivian walked to the restaurant and back, used her manners, ordered spaghetti for herself and helped me eat my pizza. She asked to take my leftover pizza home for dinner. Coach Cunningham (Eloise's note: a big PE teacher with a voracious appetite!) drove over to meet us. He offered to carry the to-go box back to school for Vivian. She politely but firmly told him, "I will carry it myself." I'm not sure she trusted him! 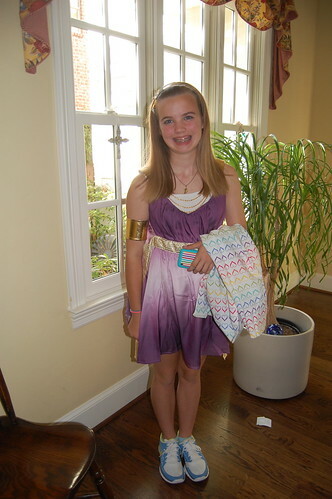 Dots was a "Greek Goddess" for Halloween this year. 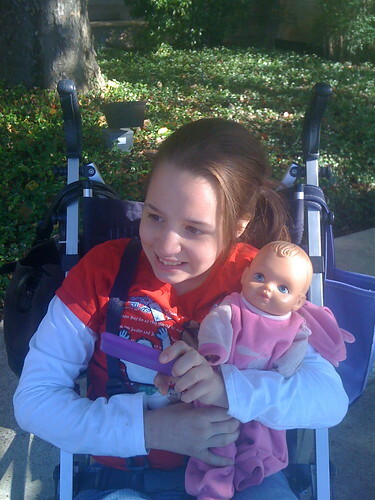 Vivian did not want to dress up or go to the block party so I have no pictures of her on Halloween! Robert and Tucker visited with neighbors briefly before Robert and I left for the World Series. 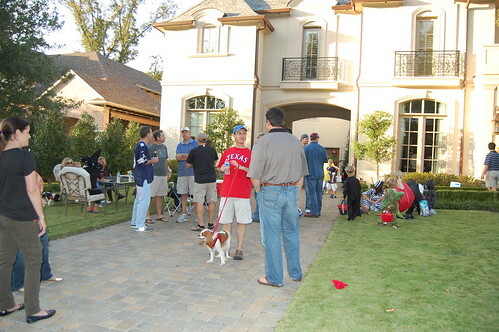 Notice the neighbor dressed as a Dallas Cowboy. He said that was about the scariest costume he could think of this year - LOL. Last night I hosted Robert's direct reports from work here for dinner. 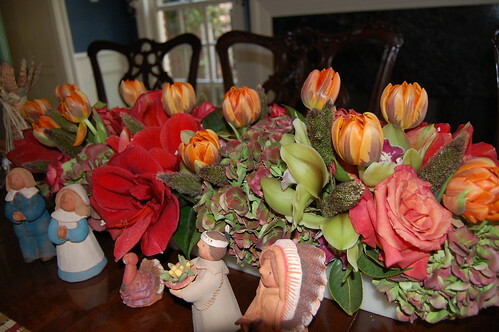 I set my table using some fall linens that my mother sent me, and I was thrilled with how pretty everything looked. Aren't the flowers gorgeous? 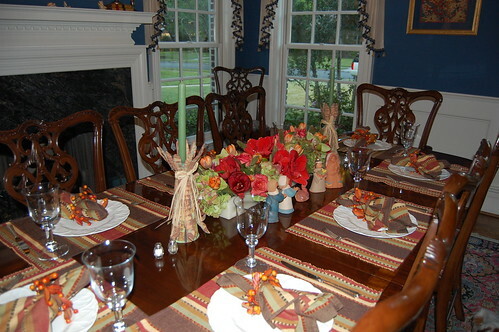 Expect to see this table again as I am hosting Cooking Club next week and having all of my family for Thanksgiving! 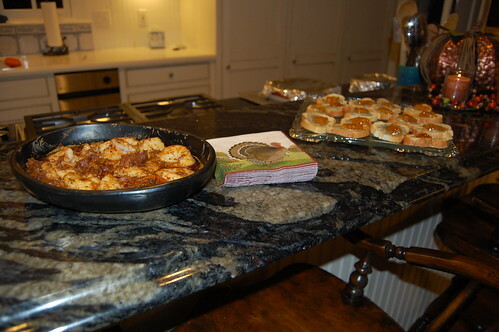 For the hors d'oeuvres I served Sue's Cajun Shrimp and some Blue Cheese Appetizers (isn't that an exciting name?) that I found on Epicurious. The shrimp is a favorite standby that is always a hit, but this was the first time I'd made the blue cheese appetizers. They were quite good and extremely easy, though I might experiment with using Stilton cheese next time to see if the color looks better on the toast. For dinner I served Beef Tenderloin, Yam and Potato Gratin, Carrot Soufflé, Haricots Verts with Feta and Pecans, and rolls. Dessert was White Chocolate Bread Pudding, also from Epicurious. I was pleased with how everything turned out. 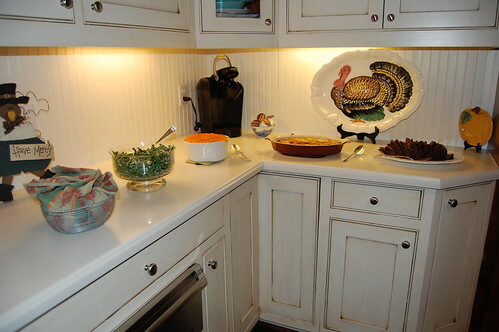 Many of the dishes were favorites of mine from past Cooking Club gatherings. At one point during dinner I commented that I hoped our guests didn't mind that Robert had elected to have them to our home rather than taking them to a restaurant where they could have chosen what they would eat. One man responded, "Oh, no, I never choose this well in a restaurant!" I thought that was one of the nicest compliments I've ever received! Preheat oven to 375°. In a small pan add the butter and all other ingredients except the shrimp. Simmer for 5 minutes. Place shrimp in an open baking dish, and pour sauce over the top. Stir once to coat all of the shrimp. Bake in an uncovered dish for 20 minutes. Serve with toothpicks. You can double the amount of shrimp without increasing the amount of sauce. Let tenderloin marinate at room temperature for one hour prior to baking. Preheat oven to 500° F. Place tenderloin on a rimmed baking sheet and sprinkle to taste with lemon pepper and seasoned salt. Bake at 500° for 15 minutes. Turn off oven but leave tenderloin in the oven for 45 more minutes. Do not open oven door. At the end of 45 minutes remove tenderloin from oven and allow to stand at room temperature for 20 minutes before carving. Blanche green beans in boiling water for 4 minutes. While draining them, run cold water over to stop cooking. Whisk together oil, dill, vinegar, garlic, salt, pepper and onions. Place beans in serving dish and toss with pecans and feta. Just before serving, pour vinaigrette over top. Serve chilled or at room temperature. Butter baking dish. In a small bowl combine cream, salt, pepper and nutmeg. Cover bottom of pan with a single layer of Russet potatoes, slightly overlapping slices. Drizzle lightly with cream mixture. Cover with a single layer of sweet potatoes, arranged similarly. Drizzle lightly with cream mixture. Sprinkle with chives and Parmesan. Repeat layers, ending with Parmesan. Cover with foil, dull side out. Bake at 350° for 30 minutes. Uncover and continue baking 30-45 minutes longer, until cheese is browned and potatoes are tender. Cover carrots with water and simmer for 10 minutes. Drain, add butter and purée with a stick blender. Add remaining ingredients and mix well. Pour into a greased 2-quart soufflé dish and bake at 350° for an hour.